You just know this film is going to scoop the Best Film award at The Oscars. Not because it's worth it - it's not. Argo, Zero Dark Thirty and Beasts Of The Southern Wild are all better films. It'll win because it ticks all the boxes. Faithful portrayal of a revered historic figure? Tick. Stellar support cast, helping the leading man shine? Tick. Yup, all the little duckies are in a row. That's not to say Lincoln is a bad film - it isn't. It's just not as great as it would have you believe. It's pedestrian in the extreme, it's over-long, more people make speeches than the man himself managed in his lifetime, and it's cloying sentimentality actually detracts from the good work Lincoln did - and that this film manages. On the plus side, Daniel Day Lewis is outstanding, carrying himself with the tired grace of a man entering his second term with the pain of war still hanging around him like a shroud. He is stern when needed, impish when telling stories he knows both annoy and distract, aloof and distant when matters of state (and family) weigh heavy. Sally Fields plays Mrs Lincoln like a woman thinking this could be her last throw of the Academy dice, slightly hammy and over the top, but still manages to convince as the power behind the White House Throne. Elsewhere, Tommy Lee Jones is at his gruff, understated best as Thaddeus Stevens, James Spader is surprisingly joyous as Mr Bilbo, John Hawkes (off of The Sessions and Martha Marcy May Marlene) continues to show just how good an actor he is and David Strathairn is wonderfully cold as William Seward. As for the subject matter, Steven Spielberg manages to have the conversation about slavery Quentin Tarantino thought he was having with Django Unchained - bringing to life the struggle to pass the 13th Amendment into law. OK, it's still not a look at slavery from the point of view of the poor sod in the chains, but the passion of those trying to do the right thing, in the face of those who resented the thought that black people should be treated as equals, is well staged. After that, it all starts to get a bit bogged-down in its own self-importance. Obviously there were political machinations - Lincoln was trying to outlaw slavery while simultaneously ending the civil war. He was a busy guy. It's just that there are moments when the whole thing feels like a Dickensian-themed episode of The West Wing with Forrest Gump's mum as the special guest. It feels stretched, convoluted, as if Spielberg had decided how long the film was going to be and just kept adding bits when he fell short. ("Damn, need another five minutes.... who else can we have being persuaded to back the bill...?"). And it trots along like one of the Lincoln's slower carriages being pulled by a lame horse. There are moments when you are willing John Wilkes Booth to arrive ahead of time. Finally, we get to the vote - which, given we know the outcome, is actually tense, sharp and well constructed and delivered. And you think it's over. I mean, what else is there to say and do? He's freed the slaves, got The South to surrender, there's nothing left. Cheers in the House, papers waved in air, applause and pats on back all round, Southern leaders looking like they've swallowed lemons - it's all good, no? If I'd been on my own at home watching this, I would have spent the last 10 minutes shouting at the screen. 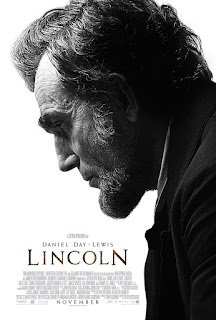 It's not just the fact Spielberg feels the need to see Lincoln through to the end, it's the manner in which he does it. Again, mawkish is the word. Poignancy played to the nth degree. There are some very good passages in this film, and as I've said you can't fault the performances, it just feels like Spielberg was trying a bit too hard.